1. Boil a pan of water and cook the Quinoa as directed on the packet. Drain any remaining water. 2. Meanwhile prepare the remaining ingredients. They key is to cut everything finely, but don’t fuss too much. 3. 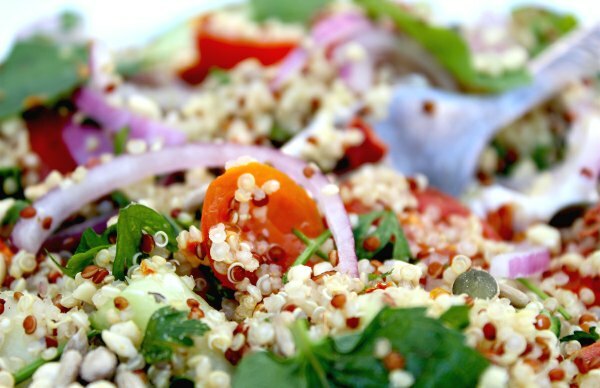 If you have the patience, allow the quinoa to cool (it’s usually served cool). Otherwise just add the remaining ingredients and stir well. Season with salt and pepper to taste. Can add more/less honey and lemon depending on preference. 4. Serve with grilled meat or fish, or just by itself. For bonus marks, can garnish with fresh mint leaves and serve with natural yogurt on the side. PS: Perfect to throw into a container and have for lunch the next day. 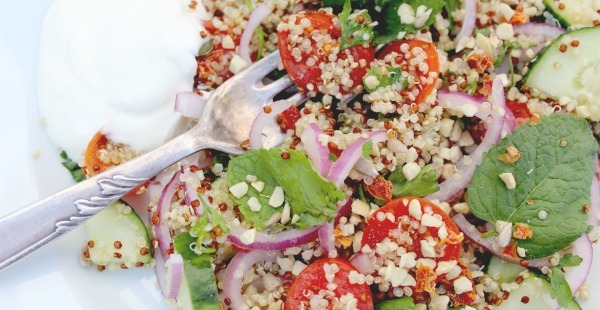 PPS: Want to know where to find all of our healthy recipes in one place? Scroll down to the very bottom of any page – you’ll see a link to “Recipes” in the footer.